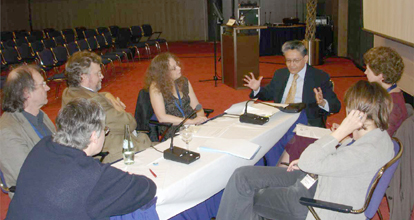 Representatives from several psychiatric survivor and mental health consumer/user organizations met with leaders of the World Psychiatric Association here in Dresden, Germany. 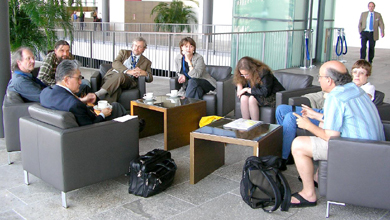 DRESDEN, GERMANY: Representatives of several psychiatric survivor/mental health consumer organizations held meetings with top leaders of the World Psychiatric Association during the past three days here. The WPA conference is on the topic of coercion in psychiatry. For more than a year, several psychiatric survivor and mental health consumer groups have been aware of this situation. I am very proud to report that these movement groups worked well together to address this challenge. We appointed author/psychiatric survivor Peter Lehmann as our negotiator/liaison with the WPA, and Peter did an absolutely brilliant job. The results? A number of psychiatric survivor/mental health consumer issued a combined public statement, which alone is important. In addition to peaceful protests outside, psychiatric survivors and mental health consumers were also speaking out inside, with exhibit tables, keynoting, presenting symposia, negotiating, protesting and most important UNITING. The WPA made several pledges, but of course the proof will be in the outcome. I would like to personally assure all who have concerns about whether WPA is telling the truththat we are being "tricked"that of course I share and respect your deeply held concerns. I too often I have seen positive words from psychiatric leaders without results, including when I was locked up and abused inside of a psychiatric institution. But also MindFreedom principles begin with those of Martin Luther King, Jr. Of course we mustand no doubt willuse nonviolent direct action and protest, including even civil disobedience. But to do this well we also need to begin by speaking directly, in as civil way as possible, to our opponents, and clearly state our situation and demands. So many psychiatric survivors and mental health consumers and our allies clearly explained the situation of human rights here at the WPA. Thank you.